Decision Making Archives | Levisay Consulting, Inc. Decision Making Archives | Levisay Consulting, Inc. Leaders, don’t underestimate your impact! With over 30 years of business experiences in companies large and small, at times working as a senior commercial executive in the food and beverage industry and more recently in running my own consulting firm that has served 30+ clients across a wide range of industries, I continue to come upon examples where key leads have dramatically affected businesses and organizations by the impact of their actions and/or inactions. While I have certainly had the chance to work closely with talented, impactful and inspiring leaders, the contrary examples abound and are the center of the following essay. In the spirit of confidentiality, I don’t plan to “name names” about specific individuals in the following paragraphs, but rather to focus on the lessons that I have learned in some key areas where I have personally witnessed senior leaders really blow it! In each of the focus areas I will review actions taken that lead an organization awry and other situations where the lack of action was the culprit to failing results. Talent: I start with a bias that I have always felt that ‘talent” in an organization is precious, and many organizations have historically treated it as fungible/replaceable/generic as they build their strategic plans. In my consulting work today, I have worked with over 30 clients over the past three years and in every assignment, we have dealt with the lack of talent, or the loss of key talent, or the inability to hire great talent into key roles, etc. as major barriers to growth and future performance for those clients’ companies. I have watched this dynamic paralyze senior leader to NOT (“sin of omission”) replace key senior direct reports who are not performing well in their roles, or who are not living up to the values of the company/organization simply because they were not sure if and how they would replace those under-performers. Senior leaders who are under-performers are a “cancer” in an organization and while it is harder now than ever to find and retain great talent, holding onto mediocre performers in a “hope” that things will get better is NEVER the right move. Have high expectations for your entire team, especially your senior team, and treat them as the precious resource they are to your company/organization, and NEVER tolerate poor performance/behavior for long. Take action and remove those poor performers before they ruin the organization! Succession: This is an area where I have watched senior leaders and boards really blow it! In large companies and small, for-profit and not-for-profit organizations alike, no one wants to take time and think about the inevitable challenges ahead when key executives depart an organization. I have unfortunately witnessed organizations really struggle when CEO’s pass away, or founders become ill, or key executives become disabled with NO succession plans in place. While succession plans certainly don’t guarantee success, the lack there of typically proceeds failure! While there is no underestimating the power of denial among boards and senior teams, a annual review of a succession plan is needed and the unfortunate reality is that too many organizations DON’T even have succession plans for the top executive roles. Innovation: As a lifeblood of so many organizations, innovation is too often thought about as incremental, episodic, and the domain of one organization ( too often R&D or Marketing.) Regarding the concept of “incremental,” innovation efforts are regularly driven to be additive to the base set of brands/products/offerings. While not incorrect, I believe it is insufficient for long term success. Innovation needs to drive incremental growth versus an organization’s current base of business AND drive to develop new concepts/products/offerings that would make your current offerings outmoded/antiquated and obsolete. In this fast paced competitive landscape, if we are not pushing innovation hard enough, we should be certain that competitors known or unknown will! One added idea on the idea of episodic, it is my experience that too often we think about innovation fitting into the annual business plan and hitting certain commercial windows. While true, we need to think about the concept of “Flow” which is defined as a “steady,continuous stream of something.” the work of innovation needs to be ongoing, and “flowing” in an organization, gaining input and ideas from across an organization and the marketplace, and “flowing” towards the market and shoppers & consumers. Personal Impact: The reality that senior leaders are watched closely, likened to deeply and talked about pervasively is more true today than ever. All you need to do is read “Glassdoor” and you can see how key leaders are discussed and reviewed. It continually surprises me to see/hear senior leaders complain that they are “under a microscope” and that the level of review and critique is “unfair.” While I am partially empathetic, I am not naive! Senior execs ARE in the limelight, ARE being reviewed in micro detail, ARE being discussed and reviewed on-line and live and that’s not about to stop! My recommendation is to not operate in denial but embrace the truth of that dynamic and turn it to your advantage. Use your personal impact moments “with intent,” (read more at https://fylegacy.blogspot.com/2009/08/act-with-intent-redux.html ) and impact the organization in the direction that YOU choose. Early on in my career I had the chance to work for a number of outstanding leaders, well before the advent of the internet and social media. Even in those “prehistoric” days, these leaders realized they were highly visible and their public actions were often designed to have the organization “learn lessons” or “build skills” in ways that were “taught” in the everyday flow of their leadership actions. Hopefully a few of these ideas have struck home and can prove helpful. Most importantly, I want to encourage all leaders reading this essay to NOT underestimate their impact, but to look for ways to have the impact that they intend on the organizations they have the privilege to lead! It was about a year ago that the “Thomas Fire” spread across Santa Barbara County, at that time one of the largest and most devastating fires in California history (as I write this essay, the “Mendocino Complex Fore is raging and is now the largest fire in the state’s history.) Purely by coincidence, I was connected to a great company at that time that happened to be based in Santa Barbara and I began connecting via email with the CEO. From late Summer into the fall of 2017, we went back and forth on a number of topics and ideas, all very interesting and engaging that ultimately led to him inviting me out to meet live and see their facility which is located very close tot he airport in Santa Barbara proper. The trip was planned and logistics locked down for me to head out to LA, and drive up to Santa Barbara for a set of meetings in early March 2018. The routing through L.A. had a personal motivation, which allowed me to stop by and grab a dinner/coffee with my dear son Bryson, though I had no inkling to the twist and turns that would emanate from that simple decision. While the morning was unusually rainy and stormy in L.A. proper ( which throws quite a wrench into the traffic dynamics for ‘The 405″) I dove into the traffic in my rental car and headed north put of L.A. enroute to Santa Barbara. Too busy with business calls and client dynamics, I had not paid ANY attention to the local weather dynamics and forecast as I took he exit off “The 5” to “The 101” and headed west. I had plenty of time to spare, having planned to get up to the offices in S.B. a good hour or so early, until I saw the large flashing sign saying the 101 was closed ahead in Ventura due to Mudslides!! Immediately I called my trusted work associate Cathy ( living in Baltimore) who went online and realized the dramatic weather related issues ahead. “The 101” was indeed closed and we were routed onto side streets in Ventura, where I stopped for a coffee/bathroom break and a live call with Cathy to assess the situation. Things looked bad across the region, and while the 101 was indeed closed, there was a route that looks open to both Cathy and I that lead north and up into the hills near Ojai, then hard west to S.B. With new caffeine induced energy in my veins, and a potential new client to see in my sights, I took off on the alternate route. The rain kept up, growing harder through the morning and was a strong steady downpour as I pulled out of the coffee shop. I seemed to be making good progress and while slow, I thought I could still make it to the scheduled meeting. Little did I know! After 20 to 30 minutes of slow but steady driving north, maybe 10 miles out of Ojai I realized that there were NO cars coming south on the divided four lane state highway and only once car on my side of the highway, seemingly following me!! I pulled over, ( the trailing car when on their way) and called Cathy again ( thank god for Cathy!!) She was surprised when I told her my approximate location because on her online map, the state highway I was on was “closed due to mudslides! !” It was un-nerving to realize that I was on a closed road, and that there were NO side options or alternate routes available not only to try to get to Santa Barbara but even to get back to L.A. Freaky indeed! I turned around and headed back south slowly but steadily hoping that I would make my way back to Ventura, and back to L.A. I had a complete mental pivot…. no longer was I worried about the timing of the meeting in S.B., i was only thinking about safely returning home…. a powerful clarifying moment! I share this story as a metaphor for so many moments in business and in life where we need to “wake up” and really see and understand the environment we are facing. I don’t want to make light of the Santa Barbara fires or mudslides/floods in anyway. Numerous individuals and families lost their lives, none the less the billions of dollars of damage and devastation that hit that region; it was major calamity that will be remembered in that corner of California for years to come. I just happened to be a pretty clueless visitor that learned an important lesson that day. Too often in business we get caught up in the immediate timing and specifics of our short term deliverables ( the meeting in Santa Barbara) and forget about the context and landscape that surrounds us! Too often we get consumed by the monthly/quarterly/annual numbers and forget that we are trying to build business legacies that should last for years or decades. remember the mudslides and work to find ways to “stay tuned in” and keep an eye on the landscape you are dealing with more broadly…. if you are lucky enough to have a “Cathy” in your life, reach out to look for help in seeing the bigger picture. it will certainly help you succeed in the short term and I suggest it will pay dividends in the future. p.s. after successfully working my way back to L.A., and ultimately Atlanta, I did indeed return to Santa Barbara for successful meetings a month or so later… and the client totally understood the need for the delay! How to survive a riptide … Professionally! While this may seem like a crazy title for a blog essay, I wanted to share some insights that are both practical for beachgoers as summer approaches and hopefully helpful to professionals dealing with changing dynamics and “dangerous tides” in their workplaces! I had the chance last week to be in Florida for a board meeting and after the opening night board dinner, went out for a quick stroll on the beach as the sun was setting. A warm and lovely night, a beach filled with shells and other walkers but no one out swimming in the very warm night air and water. I asked my host why no one was out in the surf and he mentioned the dangerous riptides in the area and pointed over to a warning sign. While not exactly that sign I have included in this essay, nonetheless a notice a warning to swimmers of the dangers and precautions of riptides. the sign stuck with me and thus this story of oceanic metaphors. 1.) 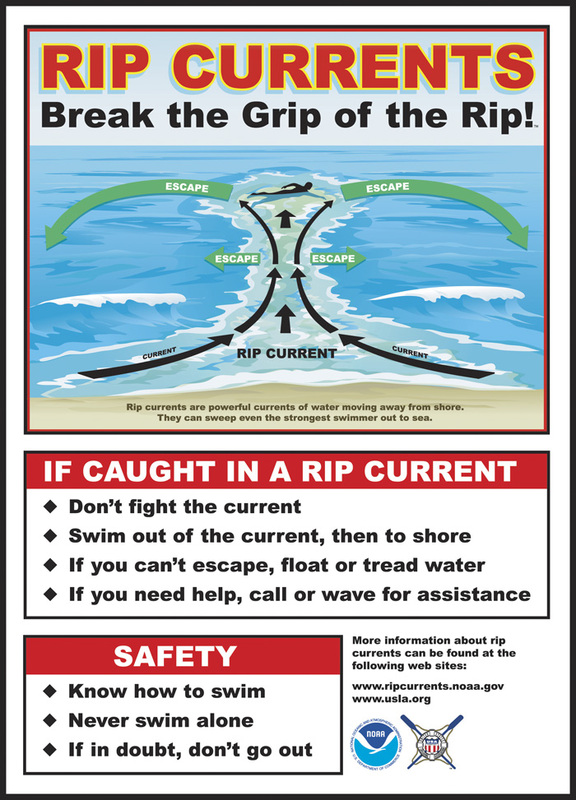 “Don’t fight the current.” After just a bit of research I found out that the huge majority of rip tide linked fatalities comes from swimmers trying to “fight the current” and swim directly back to shore, ultimately becoming fatigued and drowning in the waves. The same seems true in the landscape of corporate restructurings. Don’t try to “fight the current” and “swim against the tide” of what the company had decided to do. Organizations so often come to these inflection points for reasons of lack of growth, innovation, lack of competitive differentiation, or lack of productivity and see organizational restructuring as the only way to cut cost and boost EBITDA and EPS. While we can debate those issues in another essay, in these circumstances organizations are often desperate to cut jobs, save costs and improve profitability (and hopefully productivity) and it’s rarely productive to try to “fight” those trends/decisions. 2) “Swim out of the current, then to shore.” As you can see from the helpful diagram, it recommends swimming or floating “with the current”, looking for “escape points” to be released from the tide and head to shore. Often “riptide advice” includes the idea of swimming or floating “parallel” to the beach in order to find a weak spot or a release point of the current. Such good advice to apply professionally! Once in the midst of organizational turmoil, find spots or moments when you are “swimming parallel to shore,” looking for new structures/constructs that you might find productive for yourself or your team. As the sign shows, it may take some time and some”swimming” before the escape points are found, but the only way to find them is to “go with the tide/current” as you are looking for a safe release! 3) “If you can’t escape, float or tread water.” Don’t exhaust yourself needlessly fighting the current! Our ability to float or tread water professionally never feels very productive, but it may be REQUIRED to get yourself in position to find that release point a bit later in the process. 4) “If you need help, call or wave for assistance.” Too often our pride gets in the way of “asking or waving” for help in the work environment. If you don’t feel good about any sources of help from inside your company or enterprise, look outside for coaches, mentors or others that are not “in the rip current” with you, who might have a “fresh perspective” and the strength to help you navigate your way to shore. 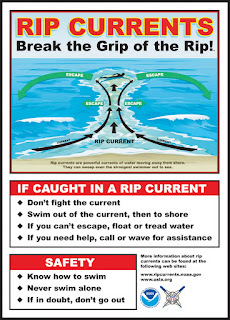 Well that’s enough of the “rip current” metaphor for today, but remember that you aren’t in the surf alone, so many have had to deal with this same dynamic, these same dangerous and destabilizing “tides!” Try to remember a few points of this advice and find ways to “break the grip of the rip” professionally! !